Opening reception at the Hawaiʻi State Art Museum on Friday, August 3, 2018, 6:00 – 9:00 p.m. during the free, family-friendly First Friday event upstairs in the second floor Sculpture Lobby, with live performances by Shoji Ledward (acoustic guitar). The opening reception is free and open to the public. The museum cafe, Artizen by MW, and the museum gift shop, HiSAM Gallery Shop x MORI will also be open, with live entertainment by Bridgefinder and Aloha Got Soul. The Friends of the Hawai‘i State Art Museum will be hosting a bar with wine and beer, as well as an opening reception for their Hawaiʻi Artists 2018 Portfolio Project. Valet parking is available at the Richards St. entrance to the building. Artists in the exhibit: Doug Britt, Bai Xin Chen, Kelly Ciurej, Janet Davis, Elizabeth Forest, Yoko Haar, Dennis Hakes, Daniel Harano, Charlton Kupaʻa Hee, Brad Huck, Zenobia Lakdawalla, Tom Lieber, Robert Lober, Michelle Martin, Marques Marzan, Deyana Mielke, Yoonmi Nam, Paula Nokes, Mia O., Jon K. Ogata, Nisha Pinjani, Hiroko Sakurai, Marilee Salvator, Jennifer Stephens, Jonathan Swanz, Mark Tanabe, Masami Teraoka, Lori Uyehara, David Valdez, and Hana Yoshihata. Artworks in this exhibit were acquired by the Art in Public Places Program of the SFCA through exhibit and artist studio visits. The art selection process involves Acquisition Award Selection Committees (AASCs), composed of Visual Arts Consultants, SFCA board members, and SFCA staff. For more information about AASCs, including how to request an exhibit visit and how to volunteer as a Visual Arts Consultant, please read more here on our website: APP Relocatable Works of Art. The STATE OF ART exhibit shares a selection of additions to the collection from 2016, 2017 and 2018; information about exhibits visited and artwork added to the collection are available on the SFCA’s website (SFCA News Blog: Art in Public Places Collection) and in the SFCA’s Annual Reports, also available for download on the SFCA’s website (SFCA Publications & Documents). In 1967, the Hawaiʻi State Legislature passed the Art-in-State-Buildings Law. Signed by Governor John A. Burns, the law established the Art in Public Places Program (APP) for the SFCA. Hawaiʻi became the first state to set aside one percent of the construction and renovation costs of state buildings to acquire and commission works of visual art that beautify and humanize the built environment. The program distributes works of art in publicly accessible state buildings to expand opportunities for aesthetic and educational experiences as part of daily life. Museum Director Karen Ewald says “the Hawaiʻi State Art Museum is a space where people are welcome to experience contemporary art in Hawaiʻi in a variety of ways. It’s a venue for community engagement and connectivity on top of being an extraordinary contemporary art museum on the island of Oʻahu. HiSAM welcomes visitors of all backgrounds to view, socialize and interact in our galleries. There is no parking on site. Paid parking is available nearby at the Aliʻi Place building (parking ramp entrance at 1099 Alakea St, on the right side after the mid-block traffic lights), Kalanimoku Building, Kinau Hale/Department of Health, State Capitol Basement (metered parking only) Honolulu City Municipal Parking, and metered street parking in the area. 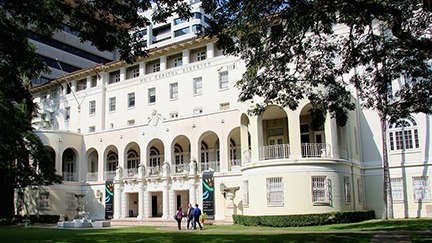 Valet parking for the opening reception and First Friday activities is available at the museums Richards St. gate, courtesy of the Friends of the Hawai`i State Art Museum. The Hawaiʻi State Foundation on Culture and the Arts (SFCA) was founded in 1965 as the official arts agency of the State of Hawaiʻi. The mission of the SFCA is to promote, perpetuate, and preserve culture and the arts in Hawaiʻi. SFCA funding is provided by the State of Hawaiʻi and the National Endowment for the Arts. The SFCA is administratively attached to the Department of Accounting and General Services (Hawaiʻi Revised Statutes Chapter 9). Read more about the SFCA in the SFCA’s 2017 Annual Report and 2019-2023 Strategic Plan.